Discovery Island is the centerpiece of Animal Kingdom. 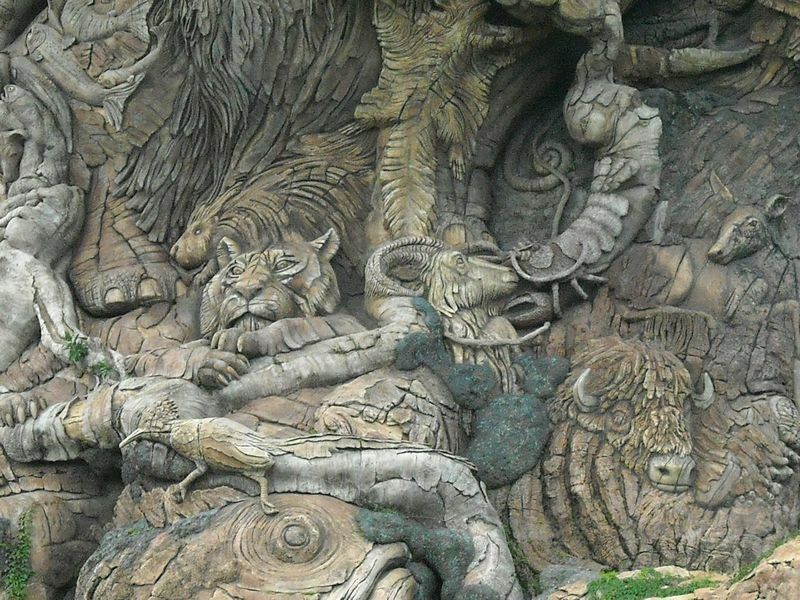 In addition to providing access to most of the other areas in the park, it contains the iconic image from the park: the giant artificial Tree of Life, with over 300 animals carved into its massive trunk. Location: Center of the park, serves as a hub for access to most other areas. Discovery Island Trails A frequently overlooked animal exhibit. It's Tough to Be a Bug! An interactive 3-D movie about what it is like to be a bug. Discovery Island Kiosk Food items for those with food sensitivities or allergies. Flame Tree Barbecue Barbecue chicken or ribs, and some hefty side options. Pizzafari Basic pizza options with some interesting sandwiches and salads. Safari Coffee Coffee, espresso, and pastries. Beastly Bazaar Tropical clothing, general souvenirs. Creature Comforts Toys, games, and children's clothing. Island Mercantile Disney character and Animal Kingdom logo merchandise, general small souvenirs.